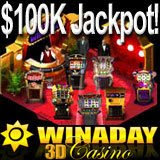 The progressive jackpot at 3D online casino WinADay.com is about to top $100,000. If it’s anything like the jackpot on its parent site, Slotland.com, that could mean it’s about due for a big win! However, with its animated casino staff and one-of-a-kind games, there really is no other online casino quite like WinADay.com, so it’s anyone’s guess just how high it will go. This is the fourth time this year that the WinADay.com progressive jackpot has gone over $100,000. Last time, it was won shortly after it hit the magic six figure mark, but the other two times it kept climbing to $148K and $159K before it was won. All of the slot machines and video poker games at WinADay.com 3D casino are tied to one large jackpot pool. The next big win could be on any of the games, but since two of the first three big jackpots were won playing the Wheeler Dealer, that slot machine is getting a reputation for being lucky. WinADay’s biggest jackpot to date was won on the Wheeler Dealer. In January, Monica68 won €116,200 ($148,724) playing that nine reel, eight pay line slot machine. The WinADay.com 3D Games Lobby features seven no-download, instant-play Flash games that won’t be found at any other online casino. There is nothing to download or install so players can start having fun as soon as they arrive. WinADay.com will launch a new video poker game called Deuces Wild later this summer.